My colleagues and I have been actively speaking about the evolution taking place in many emerging markets over the past few decades. We’ve seen dramatic shifts occurring, with the often one-dimensional economic models of the past giving way to new and diverse growth drivers. This evolution includes the rapid embrace of new technologies and the rapid digitalization of economies. Here, Carlos Hardenberg, senior vice president and managing director at Templeton Emerging Markets Group, further addresses the topic. Looking at emerging-market economies as a whole, we’ve seen a dramatic transformation from the models of the past, which were often based on commodity exports. We’ve seen a new generation of highly innovative companies located in emerging markets moving into higher value-added production processes and services. We think it’s a very exciting time for investors in this space. The technology sector in emerging markets is providing us with many interesting opportunities—from hardware to software to various forms of e-commerce and entertainment. Autonomous driving is an example of the growing clout of emerging-market companies. Many producers of the components and infrastructure to make autonomous driving a reality are located in emerging markets, particularly in Asia. And, they are highly specialized. For example, sensors, cameras, other lightweight components and software to enable autonomous driving are oftentimes produced in emerging markets. Another example is in mobile-phone technology. 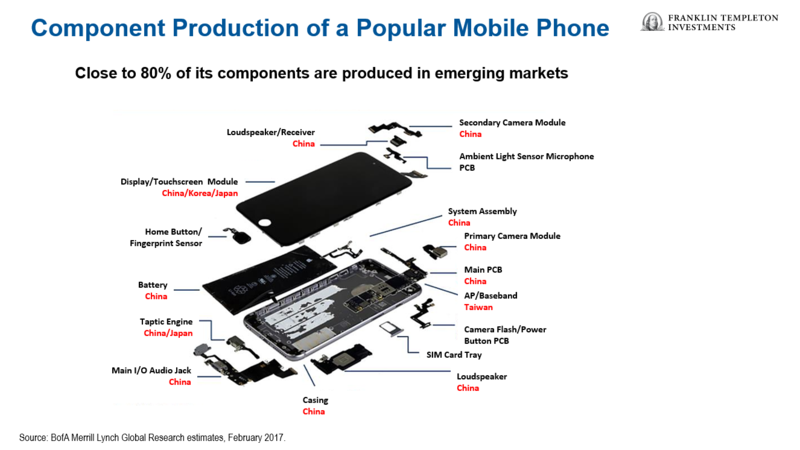 Some 80% of the components of one popular mobile phone are made in emerging markets, from the battery to the camera to the casing (see image below). We know how technology has touched nearly every aspect of our lives. It has transformed how we communicate with each other, how we shop, work and play. This is true for consumers across the globe, even in what one might consider the least-developed economies. It has been estimated that 40-50% of the world’s population has access to the internet, and 70% of youth aged 15-24 use it.1 It wasn’t all that long ago that no one did. China’s “Internet Plus” strategy, unveiled in 2015, demonstrates the key role the government hopes online businesses will play in fueling its next stage of economic growth. The strategy aims to increase digitalization across the economy and to increase the presence of China’s internet-based businesses globally. Many members of this new generation of “digitalized” consumers (including those in emerging markets) have probably never visited a physical bank branch, have never used a telephone tethered to a cord and are increasingly shunning brick-and-mortar stores to buy clothes and other wares online. In turn, consumers have more discretionary income, and the middle class is able to gain more clout. This increased spending power has driven a more consumer-oriented culture, and new and more diverse investment opportunities. According to McKinsey research, if Indonesia fully embraces digitization, it can realize an estimated USD $150 billion in growth—10% of GDP—by 2025.6 Harnessing digital technology can boost productivity and expand economic participation across the economy. While e-commerce is growing rapidly in Indonesia—one of the world’s 10 largest economies by purchasing power parity—there is still room for more progress. In contrast, in China, 82% of those surveyed expected their children to do better, and in Brazil, 79% felt that way.9 In Chile, Malaysia, Venezuela, Indonesia, the Philippines, Nigeria, Ghana and Kenya, the majority of people surveyed also believed that the next generation will be better off than the current one. Not only have consumers changed, the profile of what one might think of as an emerging-market company has as well. In the past, these businesses were generally fairly simple, nascent business models. They were highly geared towards infrastructure. During the last 10 years or so, we’ve seen a gradual migration to increasingly sophisticated business models. Emerging-market companies have established their own brand names, their own niches and have expanded beyond their home countries or region, often by acquisition. We are seeing a new generation of emerging-market companies develop. By and large, emerging-market companies have also seen healthy cash-flow generation and improving earnings. In the past, there were certain periods where corporate balance sheets were under severe stress due to foreign-exchange debt. They ran into problems, particularly when the local currency came under pressure. Today, these currency issues seem to be managed much better and corporate balance sheets appear to be much healthier. In general, emerging-market companies have deleveraged over time; they have cleaned up their balance sheets and repaired their business models. One characteristic that has generally defined emerging markets in the past—and still does—is their high growth rate. Emerging-market economies have been growing significantly faster than developed-market economies, and we anticipate this trend should likely continue. Despite this higher rate of growth, valuations generally appear much more reasonable than in developed markets. You can invest in many of these companies at a price that is a significant discount to what you would have to pay to invest in an equivalent business in the developed world. Business models in emerging markets have become far more sophisticated and robust than they ever were in the past. We are very excited about the opportunities we’re finding in emerging markets today and the potential for the future. Carlos Hardenberg’s comments, opinions and analyses are for informational purposes only and should not be considered individual investment advice or recommendations to invest in any security or to adopt any investment strategy. Because market and economic conditions are subject to rapid change, comments, opinions and analyses are rendered as of the date of the posting and may change without notice. The material is not intended as a complete analysis of every material fact regarding any country, region, market, industry, investment or strategy. 1. 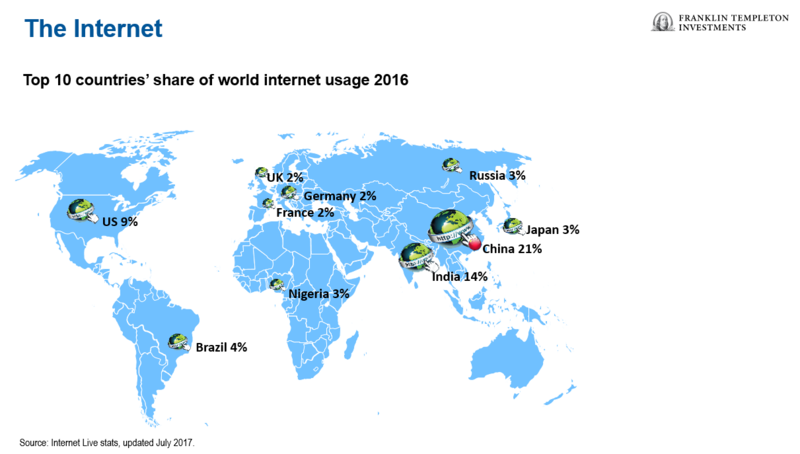 Sources: Internet Live Stats, International Telecommunications Union Facts and Figures, 2017. 2.Source: Internet Live Stats, 2017. 6. 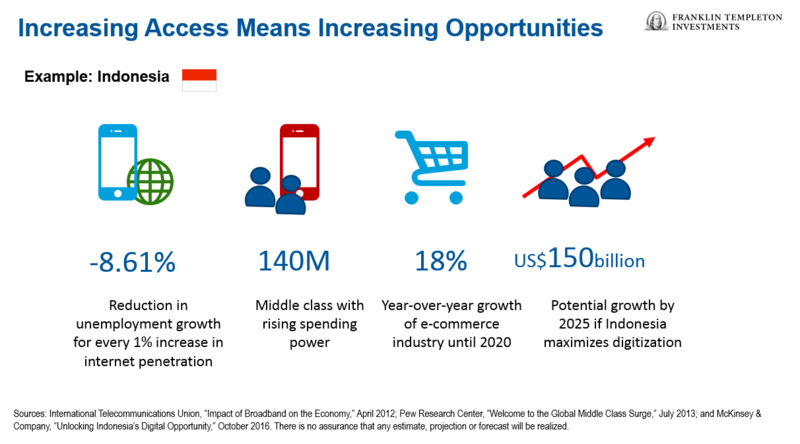 Source: McKinsey & Company, “Unlocking Indonesia’s Digital Opportunity,” October 2016. There is no assurance that any estimate, forecast or projection will be realized. 7. Source: Pew Research Center, “Welcome to the Global Middle Class Surge,” July 2013.